Volunteer Ambassadors are needed on behalf of Special Olympics Florida during the 2019 Special Olympics Florida State Fall Classic at Walt Disney World Resort. Opportunities are available Friday, November 15 – Saturday, November 16, 2019 for various events. 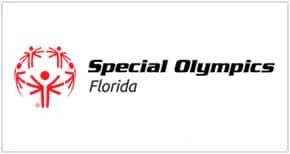 Special Olympics Florida is an international nonprofit organization dedicated to empowering individuals with intellectual disabilities to become physically fit, productive and respected members of society through sports training and competition. Special Olympics offers children and adults with intellectual disabilities year-round training and competition in 30 Olympic-type summer and winter sports. Volunteer Ambassadors are needed for the 2019 Special Olympics Florida State Fall Classic at Walt Disney World Resort on behalf of Special Olympics Florida. Volunteer Ambassador opportunities are now available. Volunteers for all events must be at least 14 years of age. Volunteers under 18 years of age must have parental/legal guardian consent and must present a waiver signed by a parent or legal guardian. Volunteers under 16 years of age must be accompanied by an adult. Children under the minimum age are not allowed to volunteer or accompany you. You will be told on the event day that your services cannot be utilized if you have children with you. This is for the safety of your child and everyone else involved. Print the waiver for ADULTS and Class B Volunteer Individual Form, and complete them. Print the waiver for MINORS and Class B Volunteer Individual Form, and complete them. Volunteer Ambassadors are expected to wear family-friendly clothing that doesn’t feature any offensive graphics and appropriately covers the body. Please wear comfortable, neutral-colored, appropriate-length shorts or pants (khakis preferred but no jeans, yoga or athletic pants) and comfortable closed-toe shoes (no sandals or flip flops). All Volunteer Ambassadors will be required to present photo identification upon checking in for their shifts. Volunteer Ambassadors must wear the proper credentials and have their photo identification available at all times. All bags, parcels and carry packs are subject to search. Please keep personal items to a minimum and leave valuables at home. Facilities are not available to store personal items. All necessary personal items must be carried in a clear bag. You may not place a non-clear bag, parcel or carry pack inside a clear bag. All Volunteer Ambassadors must go through the bag check route, with or without bags. Volunteer Ambassadors are not allowed to bring folding chairs with them. Volunteer Ambassador opportunities for the 2019 Special Olympics Florida State Fall Classic will be scheduled on a first-come, first-served basis. Schedules are always subject to change due to event needs. Although every effort will be made to accommodate your selection, the Volunteer Ambassador office reserves the right to schedule volunteers based on event needs, which includes placing volunteers on a waiting list. You will receive a confirmed volunteer schedule closer to the event. Volunteer Ambassadors will receive confirmation of their scheduled opportunities via mail approximately 30 days prior to the event or email after that time. Confirmation will include information on parking, directions and other useful matters. All Volunteer Ambassadors must sign a waiver to participate. Check back to find out when registration opens and then sign up to be a Volunteer Ambassador during the 2019 Special Olympics Florida Fall Classic.